Tax reform is making progress, but there’s still a long way to go according to AP/Alex Brandon. - Income tax brackets could change in 2018 if tax legislation is enacted under President Donald Trump. 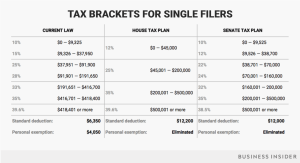 -The Senate’s bill proposes keeping seven tax brackets but changing the income ranges, while the House’s version of the bill would reduce the number of tax brackets to four. -Both plans propose eliminating the personal exemption and increasing the standard deduction. House and Senate Republicans have taken two different approaches in their attempt to overhaul the US tax code by releasing separate proposals with sweeping changes. Business Insider put together two charts showing how both the House’s tax plan and the Senate’s tax plan could change federal income-tax brackets in 2018 compared with those in 2017. Under the House’s plan, there would be four federal income-tax brackets rather than the seven we have today. The brackets proposed are 12%, 25%, 35%, and 39.6%. The Senate’s version would keep seven brackets but at slightly lower rates and adjusted income ranges. The brackets proposed are 10%, 12%, 22%, 24%, 32%, 35%, and 38.5%. About 70% of Americans claim the standard deduction when filing their taxes, and their paychecks will almost certainly increase slightly… if tax reform passes. Standard deduction for 2018: $12,200 for single filers and $24,400 for joint filers.